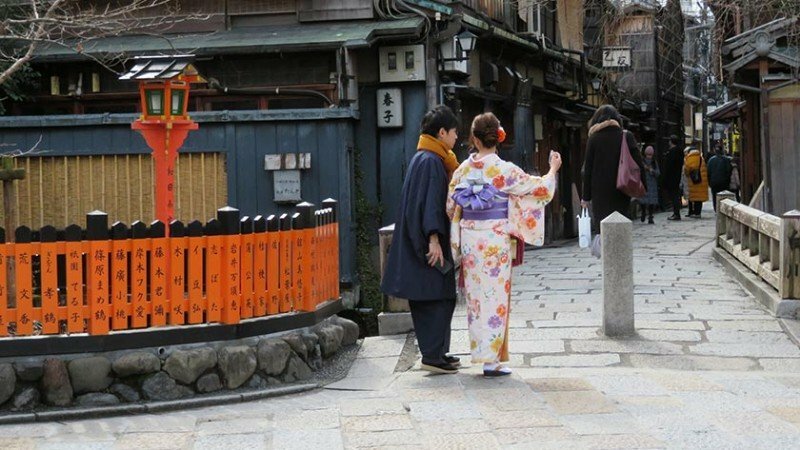 Gion, located around Shijo Avenue between Yasaka Shrine in the east and the Kamo River in the west, is Kyoto’s most famous geisha district – though the geisha in Kyoto do not refer to themselves as geisha; instead, they use the local term geiko or “a woman of art”. The district has three main areas of interest. 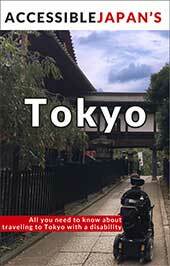 The most popular part of the district is Hanamikoji Street between Shijo Avenue and Kennin-ji Temple. 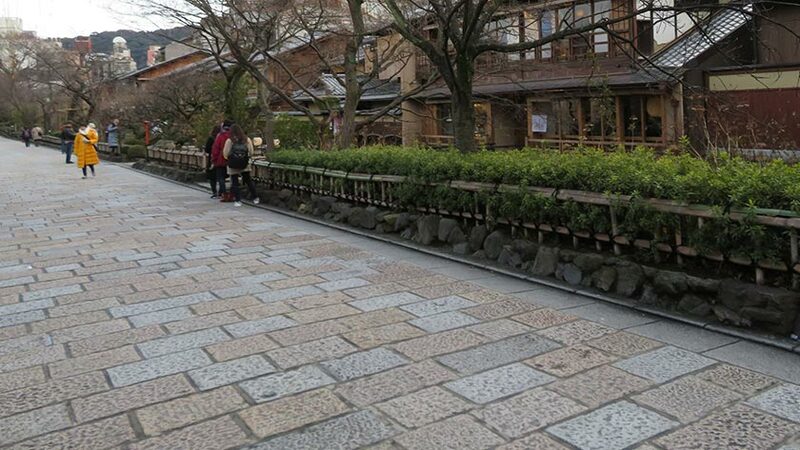 The street is home to numerous tea houses and restaurants offering Kyoto kaiseki ryori (course meals). If you are lucky, you may catch a glimpse of some geiko on their way to entertain. Shijo Avenue runs through the center of the district and has numerous stores selling local goods ranging from Japanese sweets to traditional crafts. 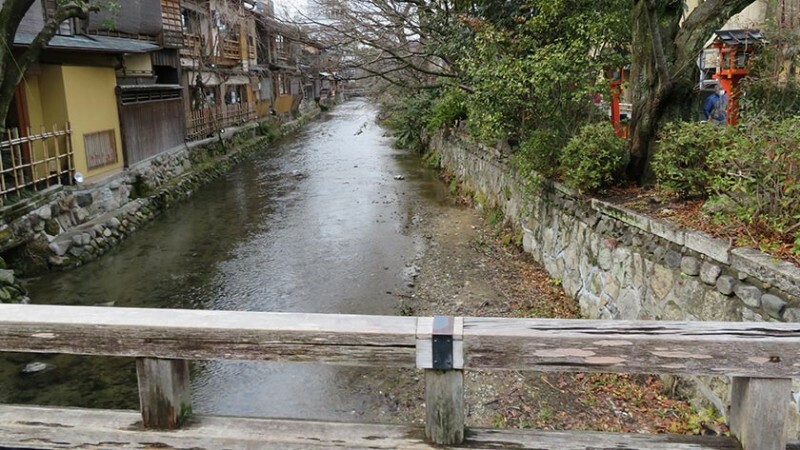 North of Shijo Avenue is the Shirakawa area, running along the Shirakawa Canal. The canal is lined by willow trees, high class restaurants and tea houses. 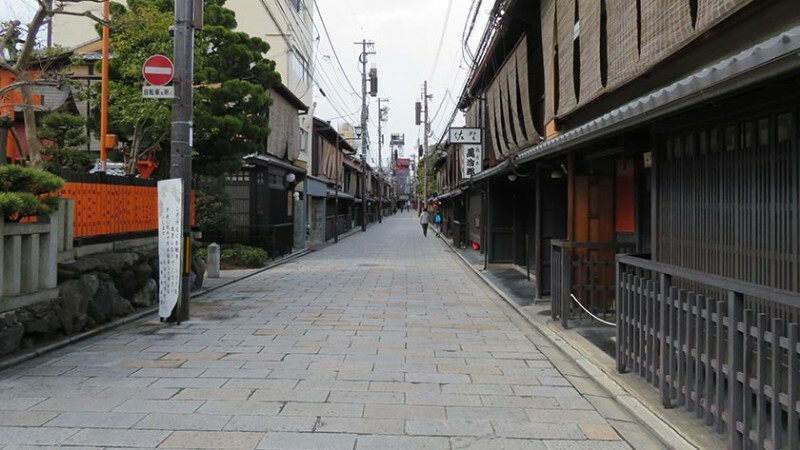 The Shirakawa Area tends to be quieter than Hanamikoji Street. 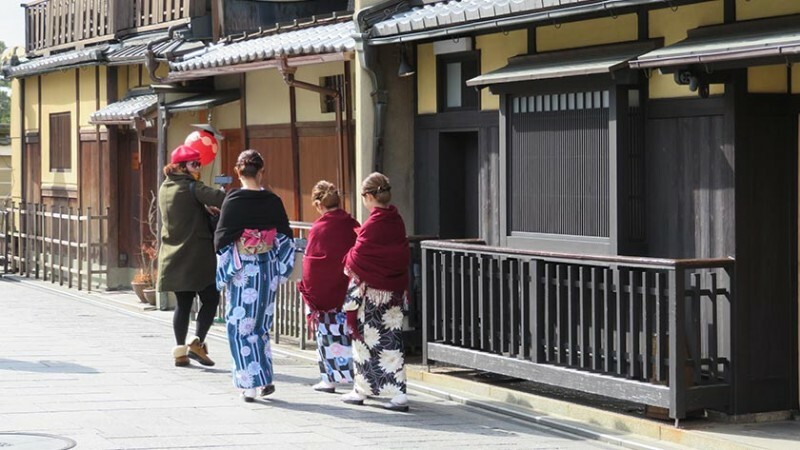 If you are interested in taking in some of the traditional arts, Gion Corner at the end of Hanamikoji offers short performances of a tea ceremony, ikebana, bunraku, Kyogen comic plays and dances performed by real maiko (apprentice geiko). 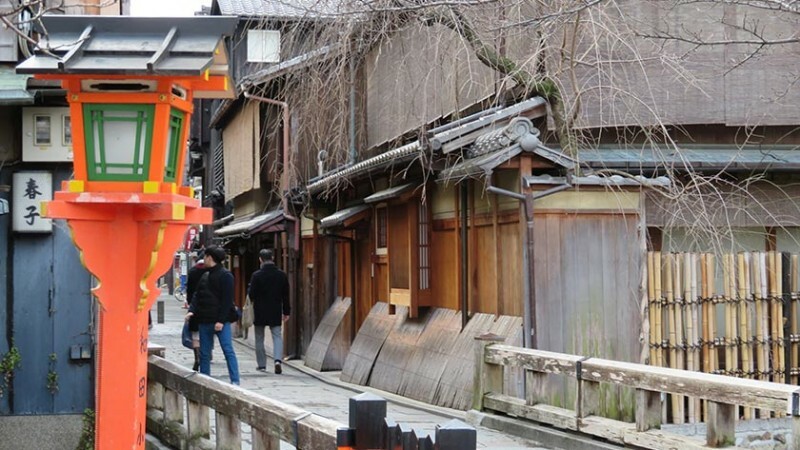 Gion can be reached via bus (Gion Bus Stop) or train. Gion Shijo Station on the Keihan Line (station map, Exit 7 has an elevator) and Kawaramachi Station on the Hankyu Line (station map, elevator at Exit 3 – while there is an elevator at Exit 7, following that route requires using an accessible escalator which can be a bit scary). 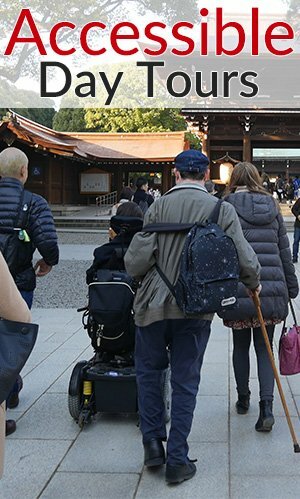 Hanamikoji is very easy to access for those in wheelchairs. The road is flat and wide, though there are many other tourists and ocassionally cars on the street, so keeping track of your surroundings can distract somewhat from the scenery. 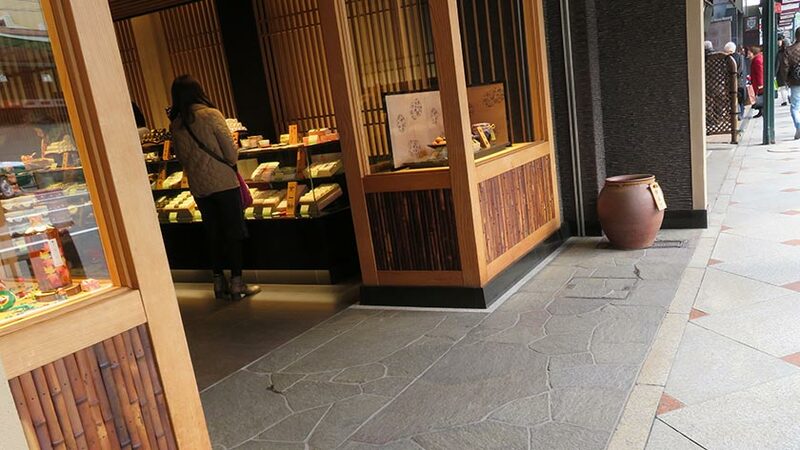 Unfortunately, most of the tea houses and restaurants have very limited accessibility as they keep with traditional archetectural designes which include steps. Some have ramps at the entrance but that doesn’ necessarily mean the inside is fully accessible. The tea houses and restaurants in the Shirakawa area are the same, but unfortunately the roads next to the canal are also an obstacle. They are made of large stone slabs which are very unpleasant to drive on – not impossible, just uncomfortable. Shijo Avenue has narrow sidewalks, but the stores are surprisingly very accessible with flat entrances and often have the doors left open. 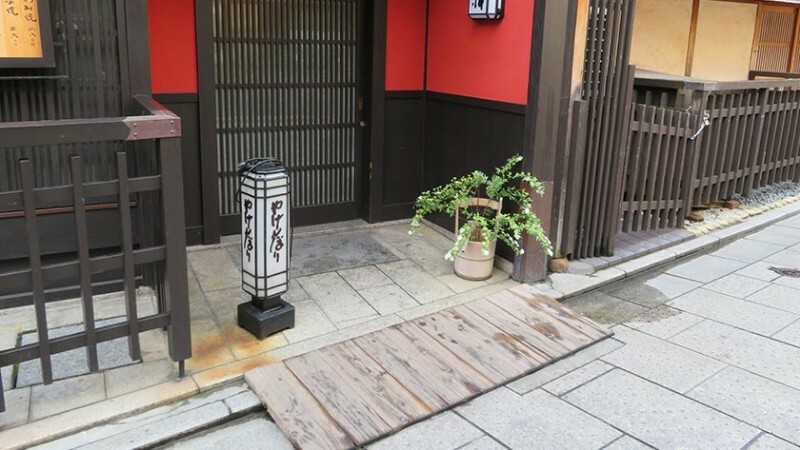 Gion Corner has an accessible entrance as well as an accessible toilet. 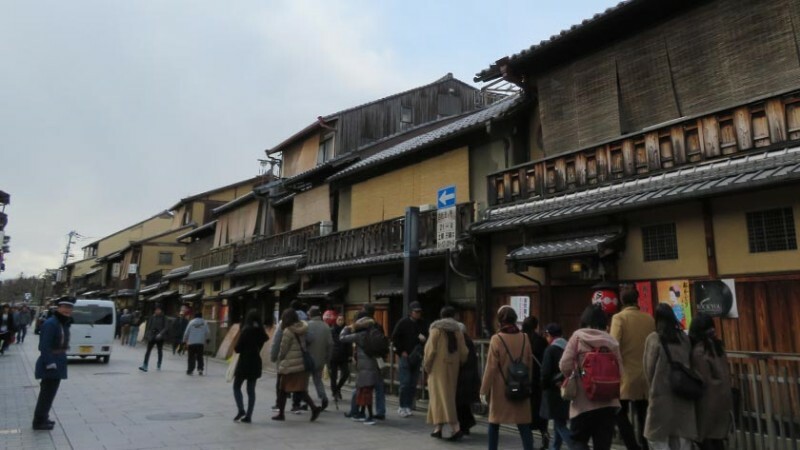 Gion should definitely be on the list of anyone traveling to Kyoto, hoping to see traditional architecture and possibly a geisha. 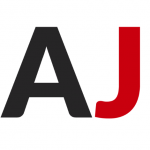 However, be sure to understand that while the streets themselves and the shops on Shijo Avenue, are accessible, finding an accessible tea house or traditional restaurant will be very difficult. Leave your questions or comments about the Gion District here!